President Donald J. Trump talks with, from left to right, with Capt. Mark Kobelja, director of Walter Reed National Military Medical Center; Dr. Ronny Jackson, physician to the president; and Dr. James Jones, physician to the president and medical director of the Medical Evaluation and Treatment Unit, Jan. 12, 2018, in Bethesda, Md., following the president’s annual physical at the medical facility. President Donald Trump's physician on Friday declared him in "excellent health" after his first known physical checkup since his inauguration nearly one year ago. "The president’s physical exam today at Walter Reed National Military Medical Center went exceptionally well. The president is in excellent health and I look forward to briefing some of the details on Tuesday," Dr. Ronny Jackson said, in a statement shared by White House press secretary Sarah Huckabee Sanders. The examination was conducted at Walter Reed by Jackson, a U.S. Navy rear admiral, who is the president’s personal physician. Trump spent a little more than three hours at the facility. Since federal health privacy laws also cover the president, it will be up to Trump to decide what information to release. The checkup for the 71-year-old president would not include a psychiatric evaluation, Sanders earlier told reporters. While there have been no known significant health events for Trump since his inauguration last January, concerns have been widely expressed about possible neurological disorders. Trump, who is the oldest president to take office, in public appearances has slurred words and grasped a drinking glass with both hands. 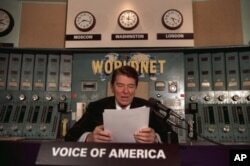 FILE - President Ronald Reagan gives his weekly radio address at the Voice of America studio in Washington, Nov. 9, 1985. Trump’s physical will be among the most closely scrutinized of any president in decades, perhaps since Ronald Reagan, who was wounded in a 1981 assassination attempt and also suffered from Alzheimer’s disease while still in office, according to his youngest son, Ron Reagan. The elder Reagan, however, was not diagnosed with the degenerative brain disease until 1994, five years after he left office. Trump’s father, Fred, developed Alzheimer’s in his 80s, a fact that has prompted calls for the president to undergo a significant neurological exam. Following this month’s publication of a widely discussed, behind-the-scenes book about his first year in office, Trump on Twitter described himself as “a very stable genius” and earlier this week he allowed White House pool reporters and videographers to remain in the room for 55 minutes as he met with a group of senators with whom he was negotiating immigration legislation. Subsequently Bornstein revealed that Trump was prescribed a statin for high cholesterol, takes a daily baby aspirin for heart health, an occasional antibiotic for the skin condition rosacea, and finasteride pills that promote hair growth.